From 1 to 5 years, continue breastfeeding as often as your child wants up to 2 years and beyond. Remember breastmilk is best and it protects baby from illness. If necessary, full cream cow’s milk can be introduced after baby turns 1. From the age of 1 give food before milk, the equivalent of about 1 full cup per meal increasing with age, and 5 small meals a day. Once babies’ teeth start appearing, they should be encouraged to bite and chew food, but always stay with your child when she’s eating to ensure she doesn’t choke. And remember – don’t force-feed him. Let him decide when he’s had enough. Your young child needs iron-rich foods and proteins such as dried beans, eggs, meat, fish, chicken, liver, mopane worms. Give your little one a variety of different foods – proteins, starches (potato, sweet potato, fortified mealie meal porridge), lots of fresh vegetables and fruits including those rich in Vitamins A and C like oranges, mangoes, tomatoes, dark green leafy vegetables like spinach and imifino, pumpkin, butternut, carrots and avocado. Grow your own if you can – it makes food cheaper and healthier! From the time they can hold bits of food and then a spoon, let them feed themselves and encourage your child to become independent. Remember – nutritious food is not only helping your little one to grow and develop physically – most importantly – good nutrition is essential for brain growth and development. Your child’s incredibly fast brain growth in the early years, means his or her brain takes up most of the nutritious food he or she eats. So make sure you give your little ones the best nutrition you can! Keep food, cooking and eating utensils very clean to prevent diarrhoea. Use clean potable water or boil your water for at least 5 minutes, cover it and let it cool. Always wash your hands and your child’s hands with soap and water before preparing food, before eating and after using the toilet. Don’t give your child Rooibos tea, other tea, coffee, creamers, condensed milk, flour water, sugar water and cold drinks. These foods do not contain any nutrients and will not help your child grow. Avoid giving your child unhealthy foods like chips, sweets, sugar, cakes and fizzy drinks. Infant formula increases the risk of your baby getting diarrhoea, allergies and respiratory illnesses. 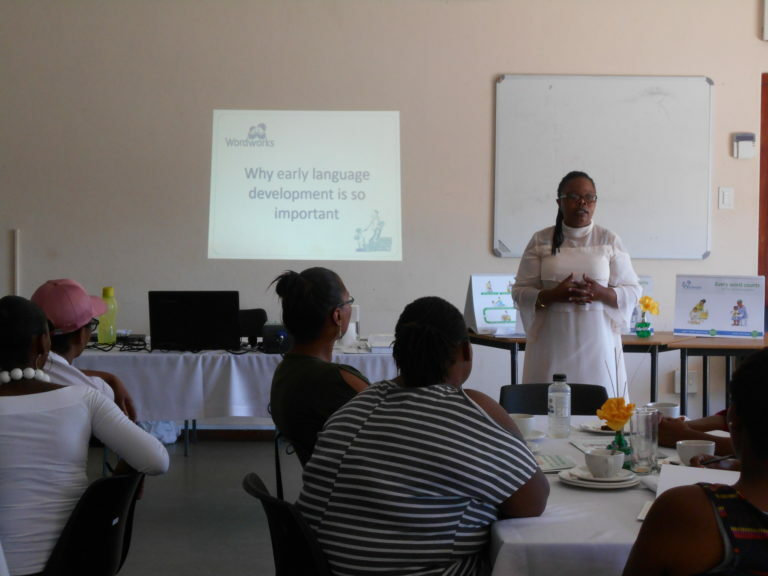 The 2018 intake of early childhood teachers includes a group of 12 SmartStart playgroup facilitators supported by the Dutch Reform Church. Playgroups are a way of increasing the numbers of young children able to access quality early learning programmes. Communities in and around Worcester are recognising how important it is to ensure their young children have opportunities for quality early learning through play to lay a strong foundation for their education and their lives. Thank you to RCL FOODS, Wordworks and FCW (Foundation for Community Work) for making this possible through ‘Every Word Counts’ monthly early literacy and numeracy workshops.